The RP Photonics Buyer's Guide contains 77 suppliers for mirrors. A mirror is an optical device which can reflect light. 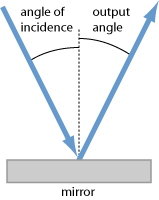 Usually, however, only those devices are meant where the angle of reflection equals the angle of incidence (see Figure 1). This means that diffraction gratings, for example, are not considered as mirrors, although they can also reflect light. Mirror surfaces do not need to be flat; there are mirrors with a curved reflecting surface (see below). Figure 1: Reflection of light on a mirror. The reflectivity reflectance is the percentage of the optical power which is reflected. Generally, it depends on the wavelength and the angle of incidence, for non-normal incidence often also on the polarization direction. 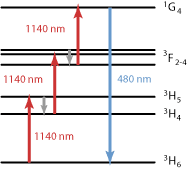 The reflection phase is the phase shift of reflected light, i.e., the optical phase change obtained when comparing light directly before and directly after the reflection. 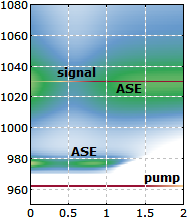 The phase shift can depend on the wavelength and the polarization direction. 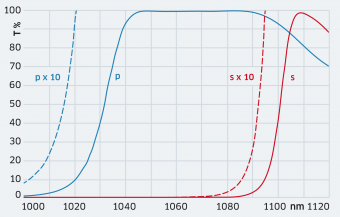 If the phase change is different between s and p polarization (for non-normal incidence), the polarization state of incident light will in general be modified, except if it is purely s or p polarization. Mirrors work only in a limited wavelength range, i.e., they exhibit the wanted reflectivity only within that range. The width of that range is called the reflection bandwidth. Of course, its exact value generally depends on the angle of incidence, the polarization and on the tolerance for the reflectivity. Similarly, there can be a limited range of angles of incidence, particularly for dielectric mirrors. A high surface quality is often important in laser technology. The surface flatness is often specified in wavelengths, e.g. λ / 10. As surface defects are largely a random phenomenon, only worst-case or statistical specifications can be given. For small localized defects, it is common to give “scratch & dig” specifications according to the US standard MIL-REF-13830B: there are two numbers, quantifying the severity of scratches (shallow markings or tearings) and digs (pit-like holes) basically by a comparison of their visual appearance with those of defects in certain standard parts. A quality figure of simple parts could be 80-50, a commercial quality is 60-40, laser mirrors should normally have 20-10 or better, and high precision parts can have 10-5. There is also the standard ISO 10110-7, which also contains a more rigorous definition based on the size of defects rather than only their visual appearance. For use with high-power lasers, the optical damage threshold may be of interest – particularly in conjunction with pulsed lasers, as these tend to have high peak powers. It is often specified for nanosecond pulses. Ordinary mirrors as used in households are often silver mirrors on glass. These basically consist of a glass plate with a silver coating on one side. The coating is thick enough to suppress any significant transmission from any side. Nevertheless, the reflectivity is substantially below 100% since there are absorption losses of a few percent (for visible light) in the silver layer. Household mirrors typically have the coating on the inner side, so that one has a robust glass surface outside, which can be cleaned easily. For other applications, the light is often incident directly on the coating and does not reach the glass substrate. For use in laser technology and general optics, more advanced types of metal-coated mirrors have been developed. These often have additional layers on top of the metallic coating in order to improve the reflectivity and/or to protect the metallic coating against oxidation. Different metals can be used, e.g. gold, silver, copper and nickel/chrome alloys. The article on metal-coated mirrors gives more details. The most important type of mirror in laser technology and general optics is the dielectric mirror. This kind of mirror contains multiple thin dielectric layers. One exploits the combined effect of reflections at the interfaces between the different layers. A frequently used design is that of a Bragg mirror (quarter-wave mirror), which is the simplest design and leads to the highest reflectivity at a particular wavelength (the Bragg wavelength). In contrast to some metal-coated mirrors, dielectric mirrors are usually made as front surface mirrors, which means that the reflecting surface is at the front surface, so that the light does not propagate through some transparent substrate before being reflected. That way, not only possible propagation losses in the transparent medium are avoided, but most importantly additional reflections at the front surface, which could be particularly relevant for non-normal incidence. See the article on dielectric mirrors for more details. Laser mirrors as used to form laser resonators, for example, are also usually dielectric mirrors, having a particularly high optical quality and often a high optical damage threshold. Also, there are supermirrors with a reflectivity extremely close to 100%, and dispersive mirrors with a systematically varied thin-film thickness. Most curved mirrors have a spherical surface, characterized by some radius of curvature R. A mirror with a concave (inwards-curved) surface acts a focusing mirror, while a convex surface leads to defocusing behavior. Apart from the change of beam direction, such a mirror acts like a lens. For normal incidence, the focal length (disregarding its sign) is simply R / 2, i.e., half the curvature radius. For non-normal incidence with an angle θ against the normal direction, the focal length is (R / 2) · cos θ in the tangential plane and (R / 2) / cos θ in the sagittal plane. There are also parabolic mirrors, having a surface with a parabolic shape. For tight focusing, one often uses off-axis parabolic mirrors, which allow one to have the focus well outside the incoming beam. Dichroic mirrors are mirrors which have substantially different reflection properties for two different wavelengths. They are usually dielectric mirrors with a suitable thin-film design.